1. Review textbook sections on the pituitary gland, thyroid gland, parathyroid glands, adrenal glands, pancreas, and other endocrine glands. 2. As a review activity, label figures 37.1, 37.2, 37.3, 37.4, 37.5, and 37.6. 3. Complete Part A of Laboratory Report 37. 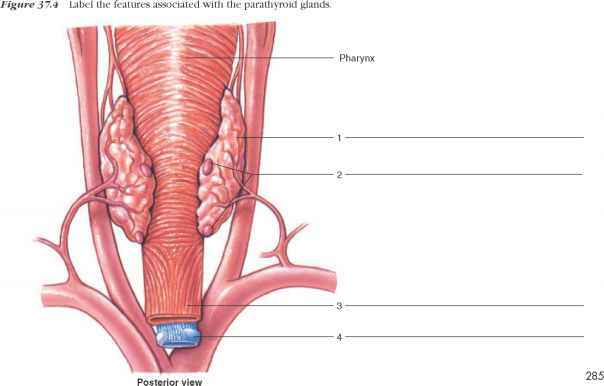 Figure 37.1 Label the major endocrine glands. 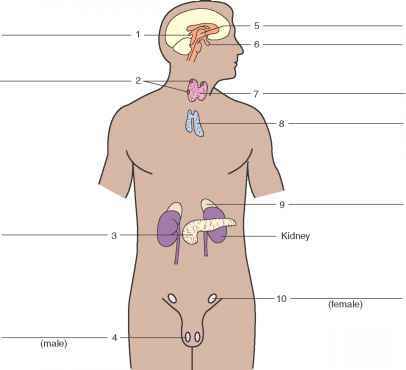 Figure 37.2 Label the features associated with the pituitary gland. Figure 373 Label the features associated with the thyroid gland. 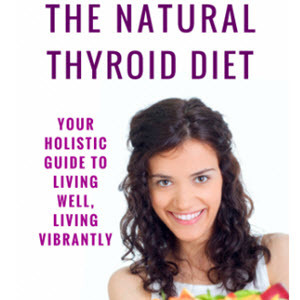 t he secretions of endocrine glands are usually controlled by negative feedback systems. As a result, the concentrations of hormones in body fluids remain relatively stable, although they will fluctuate slightly within a normal range. Similarly, the mechanism used to maintain the temperature of a laboratory water bath involves negative feedback. In this case, a temperature-sensitive thermostat in the water allows a water heater to operate whenever the water temperature drops below the thermostat's set point. Then, when the water temperature reaches the set point, the thermostat causes the water heater to turn off (a negative effect), and the water bath begins to cool again. What was the average temperature of the water bath? Figure 37.6 Label the features associated with the pancreas. a. Observe the tissues using low-power magnification (fig. 37.7). b. Locate the infundibulum (pituitary stalk), the anterior lobe (the largest part of the gland), and the posterior lobe. c. Observe an area of the anterior lobe with highpower magnification. 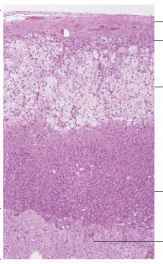 Locate a cluster of relatively large cells and identify some acidophil cells, which contain pink-stained granules, and some basophil cells, which contain blue-stained granules. These acidophil and basophil cells are hormone-secreting cells. d. Observe an area of the posterior lobe with highpower magnification. Note the numerous unmyelinated nerve fibers present in this lobe. Also locate somepituicytes, a type of neuroglial cell, scattered among the nerve fibers. e. Prepare labeled sketches of representative portions of the anterior and posterior lobes of the pituitary gland in Part B of the laboratory report. a. Use low-power magnification to observe the tissue (fig. 37.8). 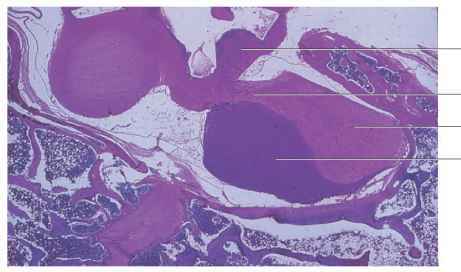 Note the numerous follicles, each of which consists of a layer of cells surrounding a colloid-filled cavity. b. Observe the tissue using high-power magnification. Note that the cells forming the wall of a follicle are simple cuboidal epithelial cells. c. Prepare a labeled sketch of a representative portion of the thyroid gland in Part B of the laboratory report. Figure 37.7 Micrograph of the pituitary gland (6x). Figure 37.8 Micrograph of the thyroid gland (100x micrograph enlarged to 300x). a. Use low-power magnification to observe the tissue (fig. 37.9). Note that the gland consists of numerous tightly packed secretory cells. b. Switch to high-power magnification and locate two types of cells—a smaller form (chief cells) that are arranged in cordlike patterns and a larger form (oxyphil cells) that have distinct cell boundaries and are present in clusters. Chief cells secrete parathyroid hormone, whereas the function of oxyphil cells is not clearly understood. Figure 37.9 Micrograph of the parathyroid gland (65x). Figure 37.10 Micrograph of the adrenal cortex and the adrenal medulla (75x). 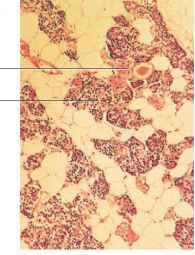 Figure 37.11 Micrograph of the pancreas (100x micrograph enlarged to 400x). — Exocrine (acinar) cells c. Prepare a labeled sketch of a representative portion of the parathyroid gland in Part B of the laboratory report. a. Use low-power magnification to observe the tissue (fig. 37.10). Note the thin capsule of connective tissue that covers the gland. Just beneath the capsule there is a relatively thick adrenal cortex. The central portion of the gland is the adrenal medulla. The cells of the cortex are in three poorly defined layers. Those of the outer layer (zona glomerulosa) are arranged irregularly; those of the middle layer (zona fasciculata) are in long cords; and those of the inner layer (zona reticularis) are arranged in an interconnected network of cords. The cells of the medulla are relatively large and irregularly shaped, and they often occur in clusters. b. Observe each of the layers of the cortex and the cells of the medulla using high-power magnification. c. Prepare labeled sketches of representative portions of the adrenal cortex and medulla in Part B of the laboratory report. a. Use low-power magnification to observe the tissue (fig. 37.11). 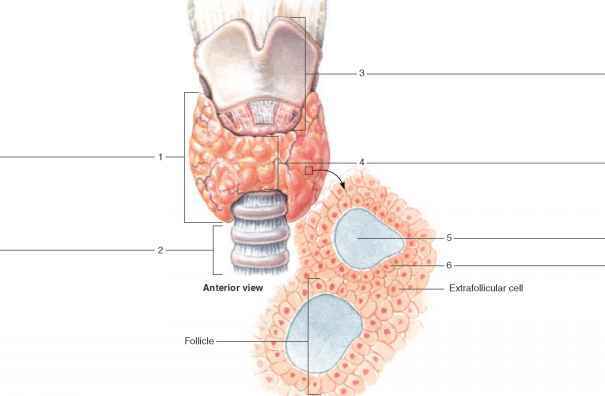 Note that the gland largely consists of deeply stained exocrine cells arranged in clusters around secretory ducts. 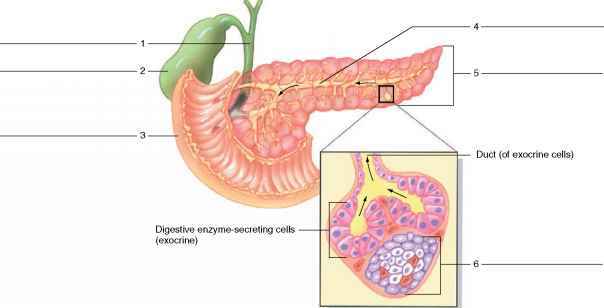 These exocrine cells (acinar cells) secrete pancreatic juice rich in digestive enzymes. 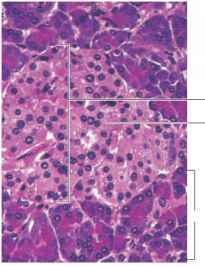 There are circular masses of lightly stained cells scattered throughout the gland. These clumps of cells constitute the islets of Langerhans (pancreatic islets), and they represent the endocrine portion of the pancreas. b. Examine an islet using high-power magnification. 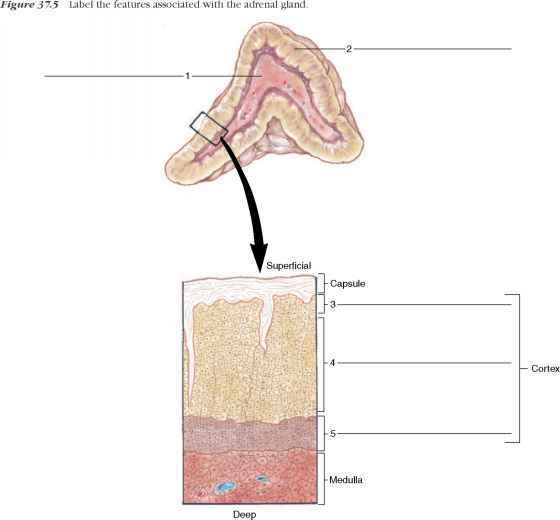 c. Prepare a labeled sketch of a representative portion of the pancreas in Part B of the laboratory report. How to label endocrine cells?